Pattie Lovett-Reid: Is there a retirement crisis looming in Canada? Do we have a retirement crisis looming when, according to a new CIBC poll, 32 per cent of Canadians between 45 and 64 have nothing saved for retirement? I’ve come to realize people rarely talk about how much money they will need in retirement. Instead, the focal point of most conversations is on what they hope to do in retirement. This may help explain why 53 per cent of Canadians polled by CIBC say they don’t actually know if they are saving enough. For many people, the amount of money required to fund maybe 30 years of retirement is a secondary consideration. Retirement planning is not a one size fits all exercise, and there certainly is not a cookie cutter approach to determining how much money you will need to sustain you throughout your golden years. That’s because the actual dollar amount you need to save will be driven by the lifestyle considerations you choose. According to the CIBC report released on Thursday, the average amount of personal savings Canadians estimate they’ll need to retire comfortably is $756,000. What’s disturbing to me is that this $756,000 figure is simply an estimate and not based on fundamentals, such as how much money you can expect from your employer, the government and various personal savings vehicles. Once those numbers are calculated, the next step is to determine how they stack up against your fixed costs, and then what’s left over can go toward other lifestyle choices. 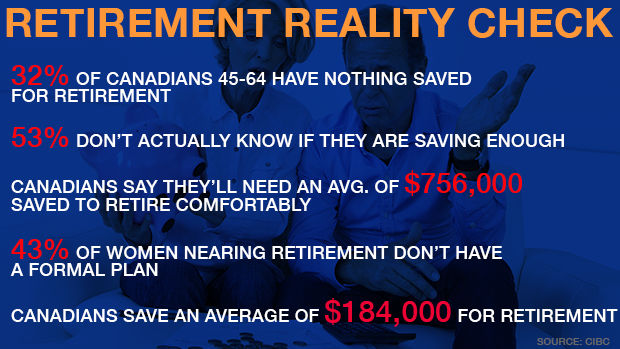 Another troublesome finding from the CIBC poll is that the average amount that Canadians save for retirement is only $184,000, while 30 per cent of respondents said they have no retirement savings and 19 per cent have saved less than $50,000. Like other studies before it, this CIBC report also highlights how fewer women than men have a formal retirement plan - 22 per cent compared to 32 per cent, respectively - while 43 per cent of women nearing retirement (age 55 and older) said they don’t have a formal plan at all. Given that statistically, women still outlive their male counterparts, and are often the primary or joint decision makers when it comes to investing, it is frustrating that only half feel confident or knowledgeable when it comes to their finances. We can and need to do better taking control of our financial situations. I’ve found it isn’t a function of capability - it is often a function of lack of time. Whatever the reasons for not saving, the reality is, if we don’t take planning and saving for retirement seriously, we run the risk of spending up to a third of our life in disappointment.